Bonjour! C’est moi! I’ve been in California, dreaming, with birds and flowers in my hair. Like a hard-boiled history detective, I’ve been combing the streets of San Francisco for traces of Paris. “Pourquoi?” you ask. Flashing back to the California Gold Rush, the French were probably the largest population in the city. That’s why! So in celebration of the New Year, rebirth, and reinvention, let’s recharge our batteries with a sentimental journey around Union Square. Here is where I left my heart, along with a few dollars, too. After all, it was wintertime, and love and a massive Snoopy the dog inflatable cold-air balloon were in the air, spurring me on to dizzying heights. Just grab your faux furs and mittens, and meet me under the old clock at the Hotel Saint Francis. After we powder our noses in the celebrity photograph-laden ladies room, we’ll sashay forth to the Romper Room Tavern on Maiden Lane to watch the twilight sky fall. As Sarah Bernhardt wrote in 1891, with gloved hands all a-flutter, “I mean to have lots of fun in this city before I leave. This is a jolly place to enjoy life in!” Or as Frankie Sinatra once crooned, “Now there’s a grown-up swinging town!” I couldn’t agree more. Here’s a tease to please. Roll the film! Stay tuned for Paris-San Francisco stories. Just be prepared to leave your heart behind. Happy New Year! Happy, Happy New Year to you, Marta! With beaucoup flowers in your hair, of course! Your post is much more thorough than mine though. Dear Brian, Your shots are fantastical! Great flashbacks. California + Edith Piaf = Bliss. Yes, what a crazy coincidence. Pretty darn cool! So you took the photographs back in 1965? They are beauties: the Golden Gate Bridge and the Powell Street Cable Car Turnaround. I also love automobiles. And thank you for the follow, though I prefer the word “sharing”. Bon week-end. We honeymooned in San Francisco, and fell in love all over again. After the 1906 quake more of the city was destroyed by dynamite than be the quake! They were still recovering from the Loma Prieta quake when we were there in 99. DiMaggio and Monroe were married there in 54 … bonne année! What lovely memories! Yes, please find the photographs. I’d love to see them. We’d love to see them! Do you remember visiting the Cliff House? I just ordered “The Birds” and “Vertigo.” A Hitchcock mini-marathon! Ghirardelli Chocolate! They recently sponsored the Jewel City: Panama-Pacific International Exposition at the de Young museum, so there were beaucoup bars (decked out in handsome wrappers) available for sale in the gift shop. And I bought more than a few! Thanks for sharing your trip memories. Keep us posted on the photographs! Thanks for reminding me of great times in San Fran. Enjoy your “French” quest. Thanks, Thom! Good. Golly. I missed your New York City holiday vitrine posts. I’ve got some catching-up to do. How was the window scene this year? I’ll visit your site, and dig up some links. I always love your dispatches from Fifth Avenue. I lived in the Bay Area for seven years, both the city and –mostly– north in Marin County. I knew there were French connections but never knew about all those spots in Union Square — really enjoyed this! Merci! Well, stay tuned for more French Connection tidbits. I haven’t been able to stop digging. Say, where in Marin County did you live? I also got to visit the Muir Beach, the Headlands and Stinson Beach. I have fallen head-over-heels for redwood trees and sea lions. I’m hooked. I even stopped by the Mammal Rescue Center. I lived in Corte Madera, way up one of the hills in a wooded hollow that backed up to a county park. Perfect combo of living in a beautiful quiet space but being in easy reach of big city life… I used to love going to Stinson Beach to walk on the beach and eat crab cakes at Stinson Beach Grill. I also headed quite often out to Point Reyes and quiet Drakes Beach out there, which I LOVED. Walking in Muir Woods was a fave too. I’m green with envy. Lucky you! Great location. I didn’t walk, but I drove through the Muir Woods. Of course, I got weepy. I also trekked it up to Leggett, California, and drove through the Chandelier Drive-Thru Tree. It was a list dream come true (since the age of six). Totally worth the five bucks, in my book! I’m still dreaming of the Avenue of the Giants . . .
Great post! Love Paris. Love San Francisco. I’m a Cafe de la Presse fan myself for a tea and a little people watching. Fabulous tip! Thank you! Yes, Café de la Presse is located on Grant Street. I think I now have a post-shopping (at nearby Zara) hot spot. If you’ve got menu recommendations, do spill. It’s in a great location. Perfect for people-watching! I completely agree. San Francisco is a beautiful city and your post was fantastic. I never realized there were all thoseoriginal French businesses. As always, thanks for your thoughtful words! I’ve missed your photography, by the way. I’ve already started creating part two. More historical tidbits and tales of heroism! Yesterday I got quite weepy. It was long time you did not post anything. I like your San Francisco presentation, its connection with Paris. You’ve brought some Paris air to this lovely American city. Thank you. Ah, as always, thanks for your kind words, Alexander! Yes, I’ve been in travel mode, working on the road. It’s great to be back. I spent an entire afternoon at the City Lights Bookshop, and then trekked it on over the nearby Vesuvio Café. I thought I spotted the ghost Jack Kerouac! Enjoy the weekend (And Happy New Year)! Merci, Rhonda! Your words made my day. My week! I’m now cuckoo about the city. The view Union Square from the rooftop of Macy’s is spectacular. This is where I enjoyed my shocking pink rose infused macaron. A glorious day! And up on the roof, I was able to touch the Macy’s sign. Not one cloud in the sky. Great to hear from you, Christine! Do you know the name of the joint? I can’t get over how much the James Bond photo looks like it was taken in Paris! Leave it to you to find traces of the City of Light wherever you go! Marvelous! Like? Heck, no. I love your words, Martino! JCDecaux installed the street furniture in San Francisco in 1996. Chicago got a set in 2001.The company is based in Neuilly-sur-Seine, Paris, France. Interesting, eh? My favorite city Theadora that I left my heart in when I left the city in 1987 – an amazing place. Your trip into Union Square was my one-stop on the weekends usually walked down to the Square visiting the many stores Neiman, Saks, being transported to another place of Channel make-up counters, perfume and jewels – just loved the whole scene and wonderfully dressed women. This my friend was a most enjoyable post today, you brought back many great memories for me. I was just wondering the other day where you’ve been – so nice to know you were enjoying Tony Bennett’s San Francisco. I remembered you tales about the city, Mary! In fact, I almost sent you a message. Union Square was beautiful, decked out in tinsel. Stockton Street (between Macy’s and Neiman Marcus was a special pedestrian-only zone with musicians and kittens in the vitrines. I loved exploring in the Hotel Saint-Francis. Each time, I spotted quite a few pilgrims standing under the clock! Stay tuned for more stories. Obsessed. Like Sarah Bernhardt, I’m now obsessed with the city. Apparently, Christian Dior also love it. I think San Francisco was his favorite American city. He visited in 1947 and 1957. The de Young Museum has a few of his dresses. During your strolls, did you visit the perfume shop? So lovely. When I lived there I used the cable cars to ride to work when it was raining, but when it wasn’t I walked and had some of the best walks down to the financial district. Another favorite was going to church over in Pacific Heights, the older ladies all wore hats and white gloves, simply another time – just loved it. A couple favorite hotels for me was Hotel Intercontinental and Fairmont (wonderful elevator ride to the top, w/a photo-documentary of the city’s history). It was the restaurants at the top of these hotels that offer amazing views and wonderful mimosa’s. The perfume shop (oh yes) – something very romantic about the whole scene. Really you bring back so many wonderful memories, love it. I am so digging the flashbacks and memories! The Fairmont. It’s now on my list. The church in Pacific Heights? Are you thinking of the 1895 Swedenborgian Church? At the corner of Washington and Lyon Street? If so, I loved this little Arts and Crafts stunner. The chairs are incredible. I spent one rainy afternoon here. They opened it up for me. The perfect place on a blustery day. The Cliff House is now another favorite spot. I could go on and on . . .
Great post! Love the art and the sweet vintage shots. My first of many visits was in 1967, such a fantastic City! From deep in the cupboard of buried memories she pulled out the dusty box marked “photos – l967”. Searching for the iconic photo of herself standing under the street sign HAIGHT ASHBURY. A psychedelic fashion statement in a brilliantly patterned dress and purple shoes. Years passed. She returned again and again to the city but the memories she cherished were not of the sophisticated restaurants and posh hotels – but the exciting adventures of that free spirited flower wearing time. Haight Ashbury! Oh, I would love to see that photograph, Virginia. Was it on the top of pile of images in the dusty box? Decked out in a purple shoes and a patterned dress? Was it a mini or maxi? Velvet shoes? Flower power, indeed. Now I’m singing the Scott McKenzie song YET again. If you’re going to San Francisco, be sure to wear some flowers in your hair . . .
Dear Miss T. Didn’t find the photo but I am still looking. The shoes were dark purple leather with a thick heel. I was completely in love with them, and I was wearing my dresses ABOVE my knee. I bought a tiny bouquet of fresh flowers – violets that I managed to keep alive and take back to minus-forty below Saskatchewan. Dear Virginia, Do keep searching for the photograph. At least we have your ab-fab word painting. You can never go wrong with purple leather shoes with a thick heel and a bouquet of violets. So they survived the jaunt? Of course, they did. I’m still looking Miss T.
What great pictures, awesome! I wish you a happy new year! Merci, Cecilia! And Happy New Year! Happy New Year, Janet! Sorry about the head spinning. I always travel with one foot in the past. Say, where did you stay? Any hotel recommendations? Favorite museums? Did you make it to the swanky Cliff House? As always, thanks for your sweet words. Stay warm! Happy 2016, Theodora!! Always great to see a post from you and this one was so much fun. The mix of old and new photos had my head (or mind; no “Exorcist” stuff here) spinning for a moment and pulled me back to a few years ago when we were in SF and stayed just off Union Square. Always a pleasure. So you plan to return for your anniversary? Enjoy! And Happy Anniversary! Do you have a favorite neighborhood? The Vesuvio Café (near the City Lights bookshop) broke my heart. So many literary ghosts! It was great fun to drink a glass of wine on the second floor as the sun set. A great place to people-watch! It was a hustling, bustling scene, inside and out. And I agree! Napa Valley is also beautiful. Managed to visit more than a few wineries. Gorgeous drive! Eureka (home of the Kinetic Sculpture Race) was also pretty darn wonderful. Happy new year, T! How fascinating and another city I’d love to visit. Why is the sight of Snoopy a spur to wistfulness (this is party rhetorical, so feel free to ignore)? Adore your shots! I know, Richard! On that day, Snoopy the dog was the closest thing to heaven. It was nearly a sob fest. Blame it on the rooftop view and the macaron sugar rush. The nearby café was even playing The Cure’s Mint Car: “The sun is up, I’m so happy I could scream!” Yes! You must visit San Francisco. You’d love it. As a former Bay Area resident (I lived on the island of Alameda, between SF and Oakland) I too, enjoyed your post about sites in Union Square I took for granted. Please keep sharing your research! I travel back every six weeks for work, so I plan to head back into Union Square and try to visualize that Eiffel Tower on the rooftop. Thanks for your swell words! Yes, stay tuned for the San Francisco retail sequel. I’m hard at work on part two. Have you seen the City of Paris department store’s original stained glass dome? It’s now in the Neiman Marcus building. Pack a hankie and your camera. It’s a showstopper! And thanks for popping by the site! Happy New Year Theadora! 🎇🎆 San Francisco is one of my favorite cities – nice post. Glad you’re enjoying a good start to 2016 – Cheers! As always, thanks for your nice words, Lisa! YES. I agree with you and Frankie. San Francisco is one grown-up swinging town. Are you still here in San Francisco? OMG if you are we should go shopping!! P.S. I hope Monsieur Jacqueline was good to you. He can be cranky. On thing to remember….never mention the internet with Monsieur. He is anti shop on line … He would feel differently I think if he had an online shop. Golly. Gee. Bam! Thanks for sharing the link. I loved your post about Monsieur Andre. You weave a story so darn well. Did I meet him? Now I’m not so sure. Oh, I’ll have visit again. I loved his response to your soap selection. “That sir is an excellent choice,” he said. 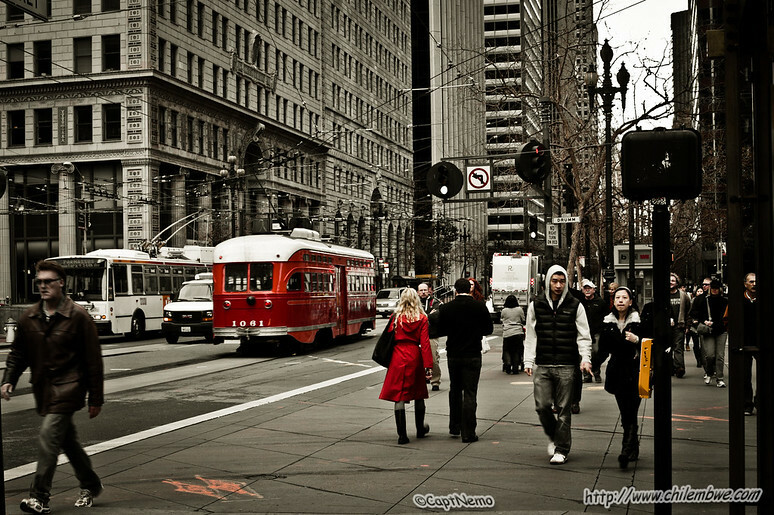 San Francisco – oh lucky you as it is one of my favorite US cities. The ethnic variety is quite the thrill for me. Personally, I love the North Beach area. Hope you had a wonderful time at the city by the bay. I’m with you, Frank! San Francisco is now one of my favorite US cities. When I wasn’t snooping around in the City Lights Bookshop, I was hoofing about the city–walking, talking, and gawking! Heaven. I was in heaven. Wonderful. We vacationed there once for a week. Stay in a hotel near Union Square, then got around the city by using a one-week bus pass. Simply wonderful … only rented a car one day for a day-trip to wine country. I’ve got the feeling you had a great time! I loved your flashback, Frank! And O! YES. I also indulged in some winery hopping and shopping! We love Sonoma over Napa … less traffic, more rural. Also had two days in SF on a cruise stop (Vancouver to San Diego) … of course one of the days we went to Sonoma. Again, what timing, Rhonda! Enjoy your trip! Oh, yes, I stopped by the Williams-Sonoma store. It was hustling, bustling. During your next Union Square visit, stop by the Neiman Marcus store. Here you’ll find the City of Paris department store’s original stained glass dome. There’s now a café on the top level. And speaking of food, do you have a favorite restaurant or cafe in the city? Again, have a wonderful jaunt with the family. And as always, thanks for the kind words!! Theadora– fun to hear from you! Loved hearing more about your trip. I’ve seen the Neiman Marcus dome once– my daughter-in-law took me there to get me things to wear to their wedding. But did not know there is a cafe to lunch in! I will check on that. My SF favorite is Zuni Cafe in SF for a pretty meal out, the Wooly Pig to pick up sandwiches for Golden Gate Park, Nopalito for Mexican, Shanghai Dumpling King for small bustling storefront Chinese. You can see we love to eat! Oh, and BiRite ice cream in the Mission– and Tartine Bakery. Do have a Paris restaurant list hidden somewhere on your blog? I know! I know! I also love food. Jotting down the names now. Thank you for taking the time to create the list, Rhonda! And YES. Maybe I’ll start a list of favorite Paris joint. A great idea! HI Theadora– sitting at our son’s house this evening in SF– just back from Smitten Ice cream shop– where they used liquid nitrogen to freeze up each serving on the spot– so creamy! I’ll be anticipating your Paris favorites! Interesting! Lucky you! I just checked out their menu. I’ve got my eye on their homemade signature cookie dough, chocolate and pretzel mix. Oh, Sigh! ~T. Oh dear Theadora, there you are! I was worried! And in San Francisco with flowers in your hair! Well, happy new year/bonne année, Chérie, and I hope you will be back to Paris before too long! I tried to reblog your incredible post after the Paris attacks and for some reason it didn’t work. I just read it again now while I was here and am going to try to reblog again on Monday after I talk to my tech person. Have a grand time in SF! Your photos and comments are as eclectic and sizzling as ever … and I’m still waiting for your ultimate Paris guide! Bisous! Fabulous post! I haven’t been there for many years. Thanks for a lovely visit! As you know, I’m a big time fan of your Art Gowns. La Vie en Rose and Lux are personal favorites. You can never go wrong with a bodice in gold. Do you have a favorite city in world? And if so, has it inspired one of your confections? Well, I do love New York City & Los Angeles lots & lots, but in all fairness, I have not been to Europe. I’ve been all over N. & S. America. There are some beautiful historical areas in cities such as Lima, Bogota, Mexico City & more, but I find the grinding poverty in other areas ruins them for me. I’m sure I would adore Paris, Rome, London & more. Europe looks fantastic. Let me add where I live, Toronto. Like NYC, it is North American, and lacks a lot of the types of beauty prevalent in Europe. Nonetheless, it is marvelous over here. I haven’t done a gown inspired by a city, but it could be coming soon! You have a great time as well! Well, do keep us posted on your City-Inspired dress. Fingers are crossed . . .
And again, thanks for your kind words! Thanks! Yes, I’m also a big time fan of the rose-infused macaron. Marie Antoinette would have approved! What do you think of the Marie Antoinette news? Apparently, they used invisible ink? Interesting! Ah…one city I would love to visit. Glad you were able to get away. Interesting to learn about the Parisian connection and your photos are gorgeous as always. Thanks, Julia! It’s a great city for shoe shopping and window-shopping. I spotted more than a few beauties in the Louboutin vitrines. I’m with you, Captain N.! I left my heart in San Francisco. I will return! What a pretty shot. I love the red cable car. I love the red rain slicker. Timeless. Flawless, too.